It is high time that you must start considering creating your website & mobile app that can uplift your business growth. We all know that mobile industry has been booming ever since it was introduced to human race. With billions of mobile users, mobile industry has matured. Millions of people use smartphones every day to penetrate the mobile market. This growth in online search with the help of mobile devices has immensely impacted global market. Almost 29% online searches are done with the help of mobile devices. Now the question remains the same that if you must migrate to mobile devices how would you do it. The obvious choice is that were given to us are either mobile websites are native apps. The normal people find its troublesome to distinguish between the two terms. 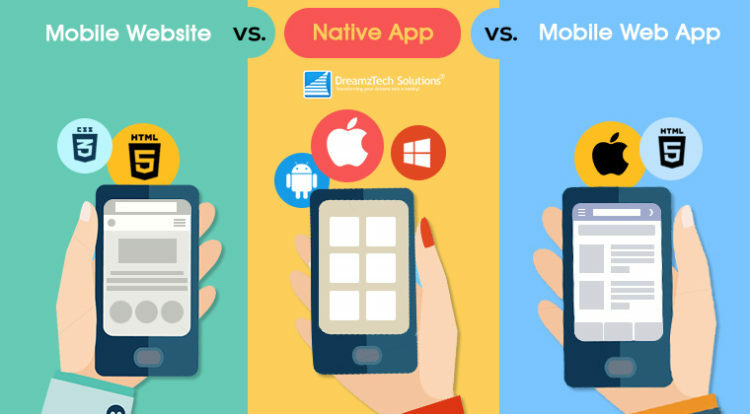 I present to you the differences and the distinctions between mobile website, native app, and mobile web app to give you a closer and in-depth view of what you can offer to the mobile industry. Theoretically you may say that the mobile website is somewhat like any other website. A mobile website basically uses HTML based pages that can be easily accessed by your handheld devices. Websites are built for desktops whereas mobile website is designed to appear in handheld display that are much smaller than the screens of desktop. You may say that it is a customized version of a regular website. Businesses can either create a separate mobile website that has a whole different URL which can be looked for by the visitors who are searching your site through mobile devices or you can use CSS files to offer access of desktop URL to your mobile users. Finally, you can use responsive website design that helps you to create website which can easily adapt to browser window. Further it employs CSS3 media queries. So, with the help of responsive website design your website can easily react to the changes no matter how small that size of the screen has. Mobile websites are at the mercy of the network the user uses. Speed is an important and qualifying factor that helps the user to stay connected with your website. Often due to network accessibility, quality of speed, location and other variants, website loading process and speed get affected. This may irate the customer and influence him to discontinue visiting your website. Thus, it is very important to optimize the functionality of your website so that you can work per the needs of your users. They will never have to wait too long for grabbing onto information and therefore they will never lose interest. Every business needs a mobile website as today consumers are searching and looking for them while on the go. Businesses like retailers, entertainment, restaurant, and much more come under which this category. They should improve their mobile website to offer much more optimized content to their users. Although these mobile web apps look very much like native app but they are built to offer fast speed and that also at a cheaper rate. With the help of HTML and CSS, mobile web app can be easily launched. Unlike Android based or iOS based products that leverage sophisticated and complex mobile browsers, mobile web apps are a far better and inexpensive alternative. Update we have now launched progressive-app.com a new venture dedicated to progressive web apps, that allow you to build your own progressive app. Mobile web app offers the same look and feel of that of a native app but in a less expensive and less time consuming way. It is like a native app. The only difference is that it can be accessed via mobile browser. By launching mobile web app, users can immediately make changes or edits. They do not need to update mobile web app in the way native apps must be updated to make changes and improvements. Most of us think that mobile web app is a cost-friendly option for most of the businesses but it comes with its on drawbacks. Mobile web apps can only be accessed when there is good network or Wi-Fi connection. It cannot be run in all the browsers. People who use age-old smartphones might not be able to access this app as technology is constantly moving and changing and so are apps getting updated. People should get accustomed to keep up with changing environment. A native app is usually written in the language of the operating system that the device offers. Therefore, the device may be Android or iOS and language would be different for the two. We can download the app from the online store such as Google Play on Apple App store and then directly install in the device. Native apps can easily interfere with features of your device such as hardware, information, camera, GPS location and can run even without an Internet connectivity. They are built for mobile audience and can easily be redesigned to fit any platform. Further they are very user friendly. It takes good deal of development and planning to create native app. What if a mobile application needs to be designed for different mobile platforms? It must use different native programming languages that means a lot of time will be consumed. For Android, Java is used. Objective C is used for iOS and Visual C++ format is used for Windows mobile. It is a tedious process. When you are designing an application for a niche audience, go for native apps. For example, a game application for youngsters. Depending on your needs such as the objectives of your business, technical requirements, and your target audience, you must decide on what to choose when bringing your business online or on the mobile devices.